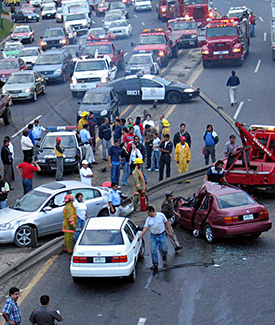 Miami-Dade County and Broward County routinely rank first and second, respectively, in annual number of car crashes in the Sunshine State. In fact, the number of automobile accidents in Miami-Dade County alone accounts for roughly 20 percent of all car accidents in Florida. Having a qualified and passionate attorney on your side after sustaining injuries in an automobile accident in South Florida can make all the difference in the world, both in terms of your optimism for a full emotional and physical recovery, as well as your ability to continue paying your bills on time and falling into a state of financial ruin. At the Law Offices of Brumer & Brumer, we have been representing car accident victims throughout South Florida for more than five decades. As such, there are few, if any, law firms that possess the same knowledge and savvy when it comes to recovering a financial award from insurance companies and other careless drivers. By this point in the long history of our firm, we are keenly aware of every tactic and ploy used by the insurance companies to avoid fully compensating automobile accidents. When you become a client at Brumer & Brumer, we will speak to the insurance companies on your behalf, ensuring you are not trapped into a statement under duress or say something to a claims representative that could hamper or preclude your rightfully chance at compensatory damages. Further, our law firm will ensure you receive the very best medical attention as well as receive compensation for lost wages as you recover. If you do not receive a monetary award as the result of the car accident in which you were injured, our attorneys will not be paid a single penny. We have built a well-deserved reputation as being compassionate when interacting with our clients, but hard-nosed and principled when speaking with insurance companies that only have their own bottom-lines in mind. Car Accidents in South Florida can be caused by a variety of factors, including distracted, drunk, incapacitated, or simply careless drivers. And the injuries that result to innocent victims can present devastating effects. Whether you have suffered broken bones, brain trauma, neck or back pain, or paralysis, our Miami lawyers will work tirelessly to be sure you are made whole. There are few feelings in the world worse than the helplessness that can arise after sustaining serious injuries after a car accident that you did not cause. Brumer & Brumer takes the time to answer all of its clients' questions and always offers an honest assessment of their chances for a financial award. Brumer & Brumer never charges anyone to share with us the details of their case -- and there is never a fee to retain our services. We encourage you to call our office today.